I’ve been knitting in all spare moment to get this shawl finished before a party I wanted to wear it to. I made it in time, but had to speed up the blocking process with a hairdryer – that was a first. I’m so chuffed with it that I’ve been wearing it at every opportunity ever since it was unpinned from the blocking mats and thrown around my shoulders that evening. Even when popping out to the Post Office. Who needs a coat when you can wear a Dreambird? It’s a good job this was finished on time because when I was pumping my sister-in-law the other day for present ideas she mentioned that she could do with a woolly hat. Only a non-knitter such as her would suggest such a thing, barely 10 days before Christmas and just a week before I’m due to see her for a pre-Christmas, hand-over-the-presents visit. Which means I am still on a relentless knitting schedule. The hat in question is to wear while going for walks rather than a smart, about town sort of a hat. The request was for one in a bright colour that will be visible in the winter gloom while walking along narrow country lanes. 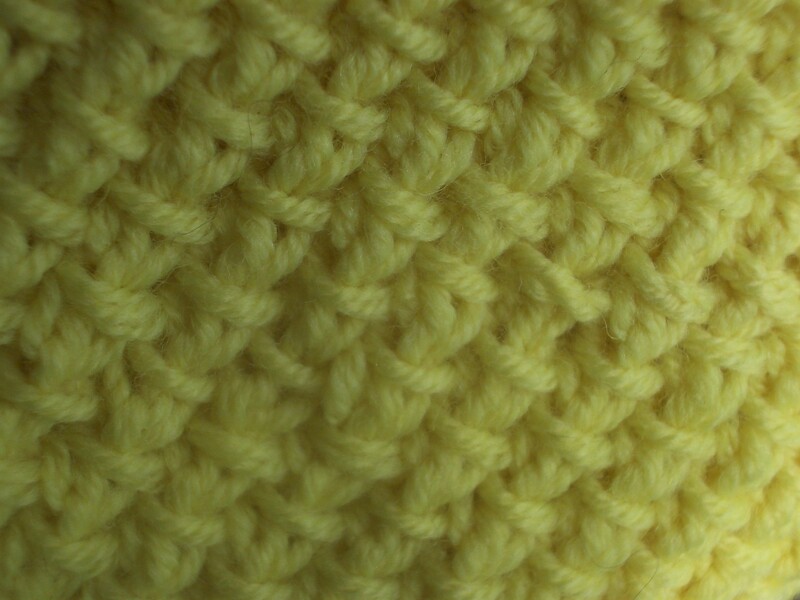 I’ve decided to use some of the acid yellow merino yarn I bought at a show the year before last. I intend to make a cardigan in brioche stitch or fisherman’s rib for myself, but I bought 1kg of yarn so there’s plenty for other things too. And to make sure my SiL is safe even in the dark, I’m going to work in a stripe of reflective yarn. The pattern I’ve chosen is a freebie called Passover Hat, the name (presumably) reflecting the stitch pattern: a slipped stitch is passed over a knitted stitch and a yarnover. I practised this stitch first because I wasn’t absolutely sure what the instructions meant. This entry was posted in knitting and tagged Dreambird, Passover hat. Bookmark the permalink. Love that stitch pattern. Even though I hate doing pass over sts, I might have to try that. Gah, I totally forgot to say how GORGEOUS Dreambird is!!! Thanks. I wore it a lot over Christmas and it got plenty of compliments. It’s a clever design – really quite simple, but with the right yarn choice it produces a stunning result. 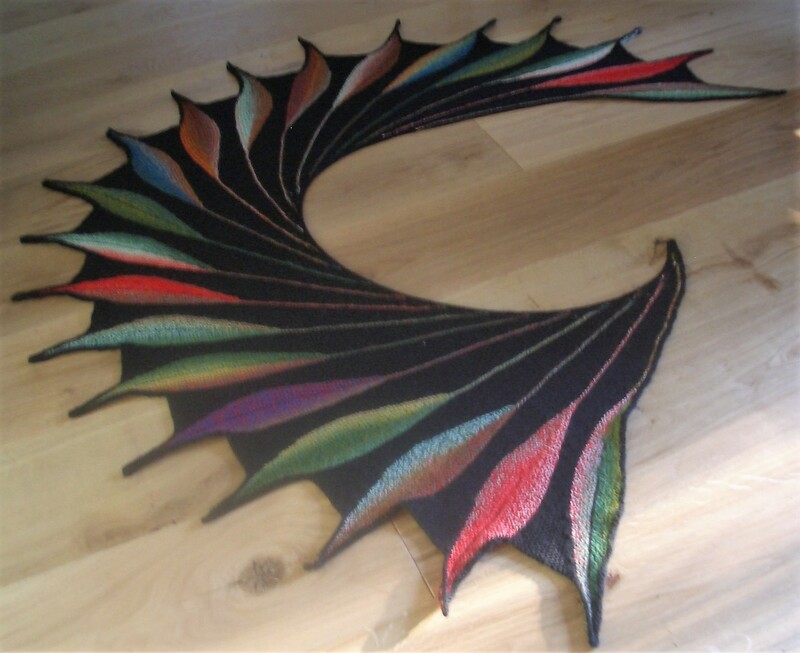 That shawl is just wow! Well done, love the bright hat too.